Well! Christmas decor is finally put away and I am slowly coming out of my annual post-Christmas funk. Ever so slowly. 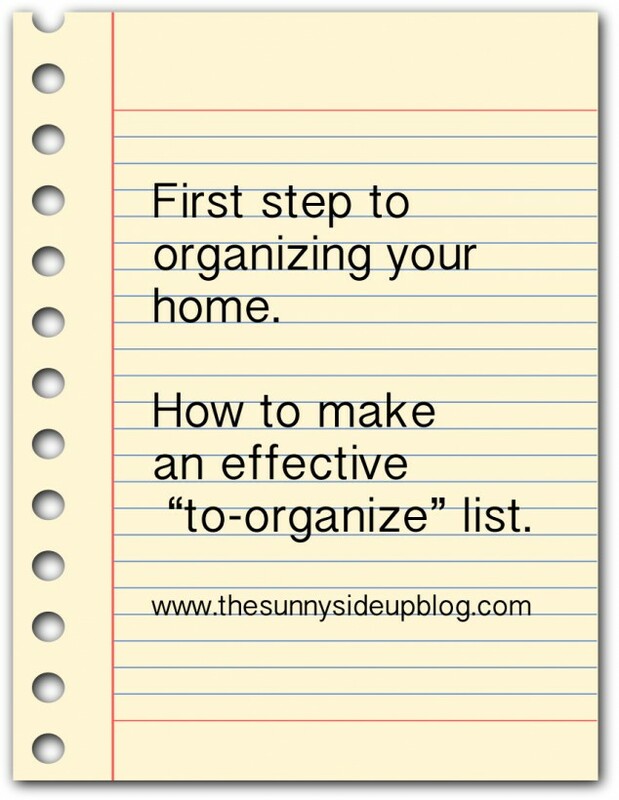 :) The one thing I always look forward to at the beginning of each new year is making my annual “to organize” list. YEA. Nothing like a good list to start the year off right! We all know how much smoother life runs when our homes are in order. This is the year! Time to get our houses organized. 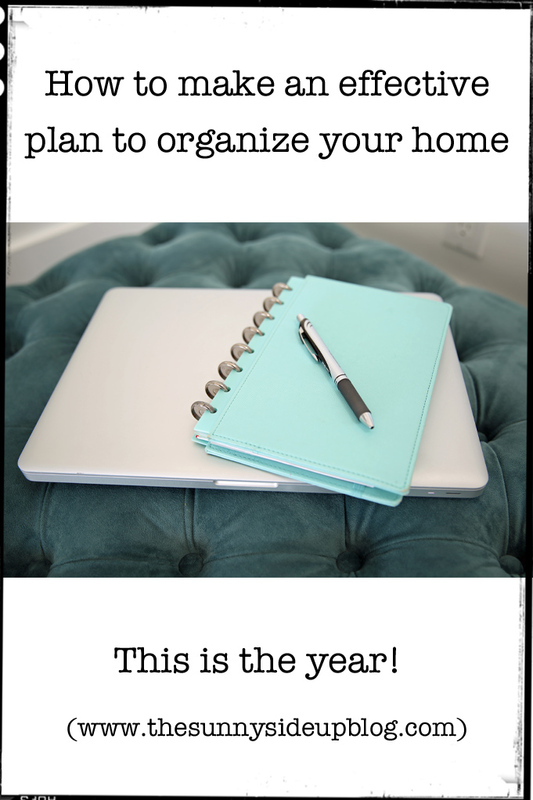 I have been thinking so much lately about how I want to plan my year as far as organizing our home. Last year I wrote a post about how to make an effective “to organize” list. Go through your house room by room with a notepad and get VERY specific about what you want to accomplish in each space. Break things down into smaller, more manageable tasks. Example: Instead of writing “organize the kitchen” write “organize the silverware drawer.” There is something so powerful about being able to check smaller things off of your list! Great motivation to keep on organizing. This year I wanted to take it one step further by actually giving myself a deadline to complete each area of my home. I’m putting some pressure on myself to make sure I accomplish everything I set out to do! Creating an imaginary deadline is one of the best ways to overcome procrastination. I loved having my detailed list last year, but without a deadline there was no urgency to finish anything and while I am happy about the things I did accomplish, I didn’t make it through half of my list! However, I also want to be realistic and come up with a plan that I will actually have time to complete. We are all busy! It’s important to set yourself up for success by not putting too much on your plate. So there you go! That is my list for the year. I am printing it and hanging it in a spot I will see every day to remind me of what I need to be working on for the month. Here is another thing to think about when making your 12 month plan to organize your house. Think about what you typically have going on each month and plan accordingly. For example, toys are appealing to organize now because we just got new things for Christmas so I put playroom under January. August is all about getting ready for back to school so it’s a great time to go through the kids’ closets. July is usually a busy travel month for us so I assigned myself a smaller organizing task. You get the idea! Make this list specific, manageable, and tailored to your schedule. Set yourself up for success! I’m so excited! Can’t wait to get working on our attic and playroom for the month of January. I hope you’ll join me! Together we can do this! One cupboard at a time. AHH! There is nothing like January after the decorations are down and the house is super clean to start thinking about organizing. Stuff stays pretty organized around here but their are a few areas that I need to re-think. Pantry, closets, and laundry storage are on my list of things to organize. A few more cute baskets should take care of the laundry room. The pantry and closets are getting a complete over haul. I love this time of year. Great plan of action. Thanks for sharing! I am definitely going to do a better job of organizing this year! I love the idea of deadlines. I made a huge list last year and barely did half of it too! Is that your planner in the first picture? Hoping the monthly deadlines give us extra incentive Amy! That was my planner a couple of years ago. I’ll share what I’m using this year soon on the blog! Hi Erin! This is the perfect time to start thinking about getting things organized! For the most part, my house looks neat, but when you open a drawer, closet or cabinet, my secrets to a neat house are revealed!! Ha! Ha! It’s time for me to tackle my house from the inside out and get working on all of my hidden problem areas! Thanks so much for the motivation!! Happy New Year!! I’m joining you on the organization train this year. Lol! I’m making my plan for the whole house but right now I’m focusing on my kitchen because I’m getting ready for a complete gut and remodel. Exciting but overwhelming!! I was hoping you would do a post on your kitchen organization and how you decided on cabinets vs. drawers, inserts, etc. but I haven’t seen one. Do you have any tips for me? Any help is sooo much appreciated. Thanks so much!! Hi Kim! I haven’t done a post on that but I need to! I’ll probably go over it all when I show how I’m organizing my kitchen. One thing I love is our appliance cupboards. They slide up and I have my toaster, crock pot, etc. in them but then I can cover everything when we aren’t using them. Good luck with your remodel! So fun! And I know – overwhelming. I’m sure it will turn out beautiful! As with every new year, my goal is to get organized! Great idea with breaking it down month-by-month! Hi Katrina! I can’t remember the name of the place! My pool guy sent me to a wholesale pool store that I wasn’t really supposed to go to because it’s not open to the public. He called them and told them to let me pick out some pool decals. I think you can find them on-line though. I remember someone saying they got some through National Pools or something? Sorry I’m not more help! Thanks for this Erin! I’m on a big organizational kick right now and my husband & I actually started tackling the disaster of our basement last night. :) The idea to break it down into manageable parts is a great one. I pinned this so it’s easy to come back to later. Happy Wednesday! I found your blog a while back and absolutely LOVE, LOVE it!!! Wishing you a blessed New Year. I so need to make a list! Looks like a great list. Will you post reminders/updates through the year? For sure Jamie! :) Thank you! Oh, you just hit my “hot” button, Erin. I love anything and everything about organizing. My hubby says I’m a bit obsessed, but he has actually picked up a few good habits since he retired…..lead by example! I kind of get giddy about setting up a new planner for the year, and creating a new list of projects. I’m looking forward to following along with your plan, which sounds so doable. Can’t eat an elephant in one big bite, have to cut it up and take slow steady nibbles! I’m going to make my list this afternoon. Thanks so much for sharing, Erin! I had this goal for 2014 but because I just had the general goal of “be organized ” I didn’t succeed. I was close though. So this year I will break my goals into months and be more specific. Here’s to a year of organization and labels!! !